The East and South is less popular and you can expect a more private experience. 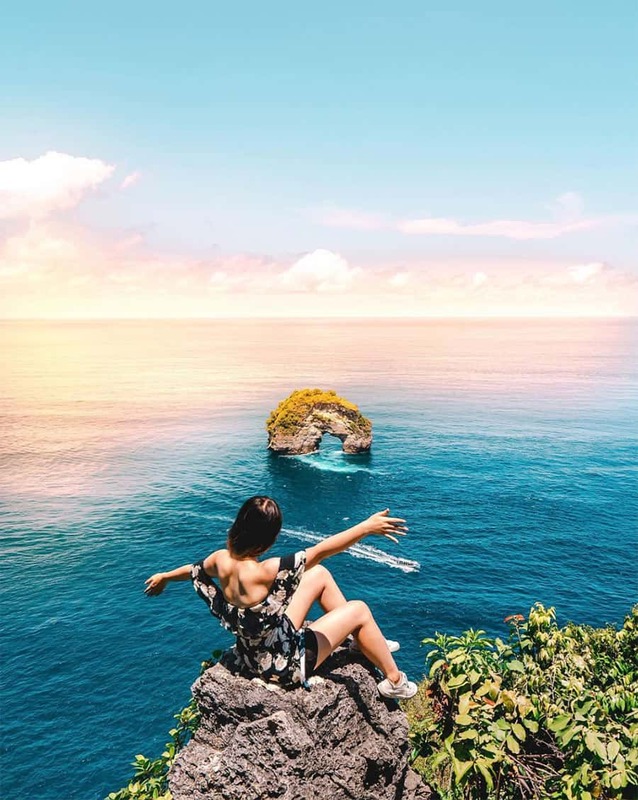 You can read through this article to learn how to get to Nusa Penida on your own OR you can book a trip with LiburanBali for better price and comfort. Take me to Nusa Penida! You’ve probably seen the photos a million time. But, Instagram doesn’t do justice for the exotic beauty of Nusa Penida. I remember the first time I went to Nusa Penida for my pre-wedding photoshoot. I had no expectation as Nusa Penida wasn’t as popular as today. But, my photographer was so excited and literally forced us to do our session at Nusa Penida. The ocean is turquoise and crystal clear. The waves was strong as it crashed the T-rex shaped rocky cliff. The sunset at Kelingking was golden. Our best pre-wedding photos were taken in Kelingking. With no effort from us at all. We were just standing watching the sun set into the ocean. If you are ever in Bali, the you should witness Nusa Penida yourself! 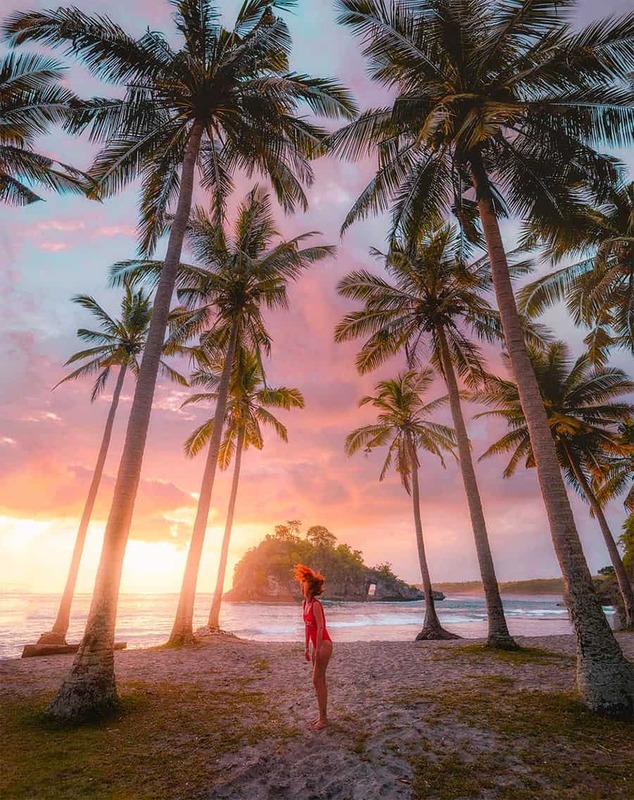 In this article I will try my best to convince you to visit Nusa Penida by listing all the best places to visit in Nusa Penida. Basically the spots in Nusa Penida is divided into three territories: The West, The The East and The South. 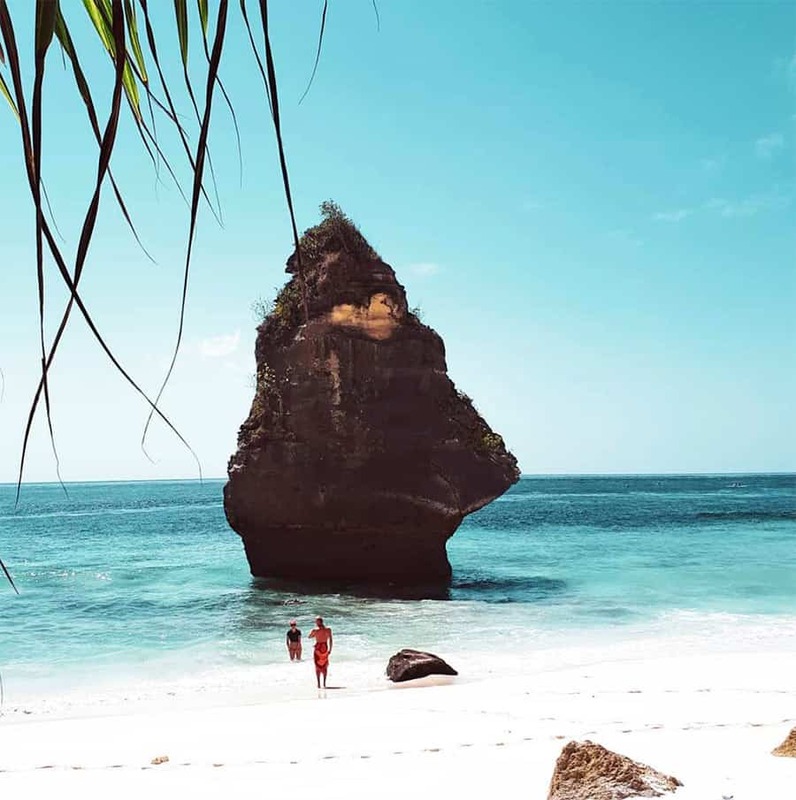 If it’s your first time in Nusa Penida and you don’t have much time in Bali, then I advise you to spend a half day trip to Nusa Penida West only. After all, all the four spots in the West are the most popular ones that you would probably have seen countless time in Instagram. Despite the name, there isn’t an actual beach here. Surprisingly enough, you will witness one gorgeous cove with an archway opening at the end which lets the turquoise color waters in. It turns out that the waves from the Ocean has been causing erosion to the cliff for centuries and create the archway that influence the name Broken Beach as the cove is not fully enclosed. I know the feeling, I bet you would love to swim around the water or even attempt to cliff jump in Broken Beach. Fair enough but, I really against the idea as there is no access climbing up. You will need to swim around to the nearest climb access at Angel’s Billabong which is actually just 100 meters away. The current is very strong. If you are not a strong swimmer,odds are that you could potentially get dragged into the Ocean. ➽ Read Complete Guide to Broken Beach for more insider tips. 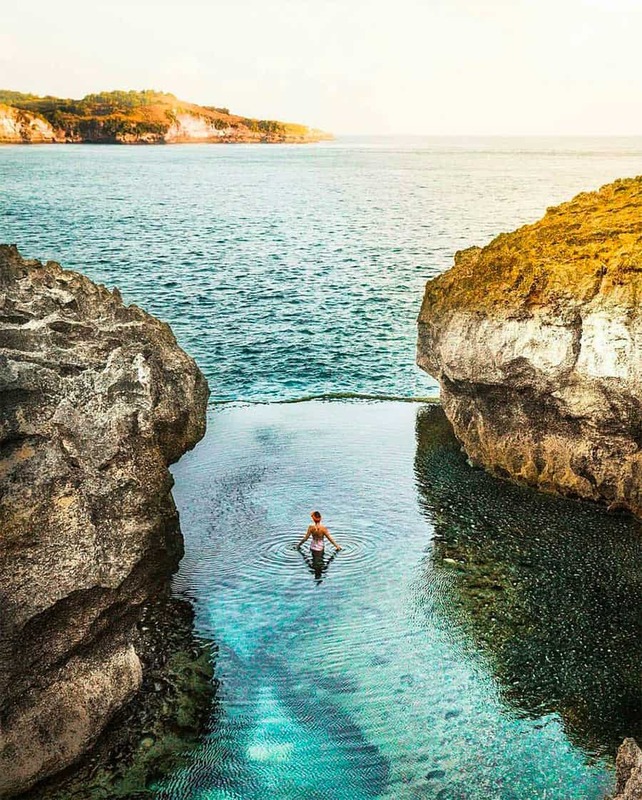 Let me say this straight, if you could only visit a few spots in Nusa Penida, you should at least come for the awesome natural pool of Angel’s Billabong. It’s even a no-brainer if you are already in Broken Beach. Angel’s Billabong is only a 500 meter walk away from Broken Beach. Angel’s Billabong is most popular for its crystal clear water tide pool where you can swim and pose for an extraordinary photo. A word of caution: you should never swim to the edge of the pool. There has been accidents where people died after being pulled into the ocean by a sudden high waves crashing over the pool. ➽ Read Complete Guide to Angel’s Billabong for more insider tips. Next is my all time favourite spot: Kelingking Beach. As I mentioned earlier, this is where I took my pre-wedding photos and they are perfect! There are actually two different way you can experience Kelingking. First, you could spend hours climbing down the stairs to Kelingking beach. You’ll enjoy an almost private white sand beach that will leave you speechless. Problem is, it’s not for everyone. You should only attempt going down to the beach only if you are physically fit as this will test your endurance at an extreme level. The next alternative is enjoying the view and even witness the sun setting behind the T-Rex shaped cliff. Here’s a little secret for you, there is a spot where you could literally watch the sunset while (if you are lucky) watching the Manta Rays gliding graciously over the Ocean. ➽ Read Complete Guide to Kelingking Beach for more insider tips. 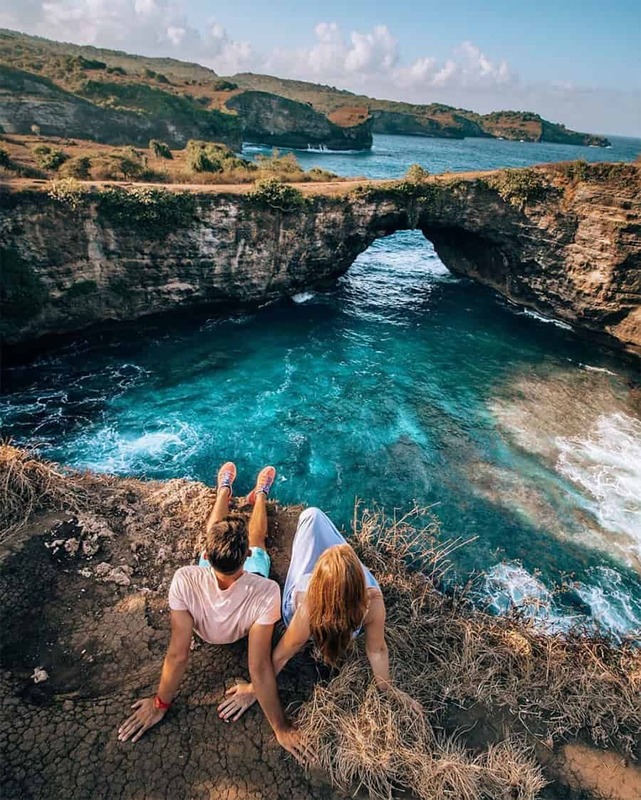 Imagine this, you have been exploring Nusa Penida the whole day and your butts are hurting so bad after continously fail to dodge potholes along the journey. The only thing you wish to do now is to relax on the beach with a fresh coconut accompanying you while watching the sun set into the Ocean. Crystal Bay Beach is a great place to relax and unwind. If you are a good swimmer, you could also spend sometimes snorkeling at the Beach and play with colourful exotic fishes and watch the corals. What’s more to do there? Say, if you have diving license, you might want to try diving in Crystal Bay Beach between July to September. The rare gigantic Mola Mola Sunfish often come to the surface to enjoy the bright sun, who know you might encounter one?! ➽ Read Complete Guide to Crystal Bay Beach for more insider tips. Now if you are like me, then you will prefer to go to the spot less popular to have a better holiday experience. I really love Nusa Penida East even though the spots are much further away from the harbour compared to Nusa Penida West. The hoards of Chinese tourists or day visitors from Nusa Lembongan are almost non-existent in the East, especially during Bali low season period. Don’t judge a book by it’s cover. Or in this case: Don’t judge a cave from its entrance! Goa Giri Putri Temple is probably one of the most unique Balinese Temple in the world. This temple is located inside a gigantic cave. To get into the cave, first you have to climb up 110 steep staircase up the hill. And once you reach at the top, there is a narrow 80 centimeter gap opening serving as the entrance to the cave. You will have to squeeze through the winding walls of the cave before you arrive inside the cave. 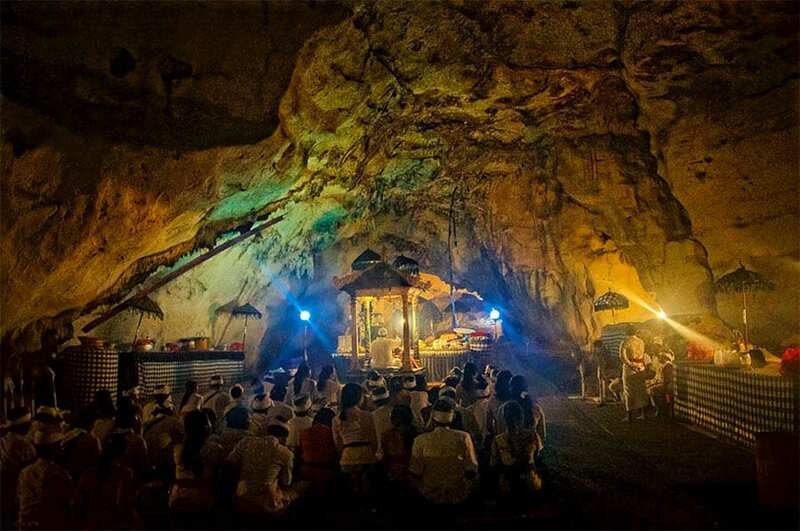 What’s amazing is this cave can accommodate more than 5,000 people that come for ceremonies. Please note that you will need to dress properly to enter the ancient temple. The priest will offer you Sarong and Holy Water in exchange of a small donation before you enter the cave. Bring a small change (IDR 20.000) as they usually don’t have change. Raja Lima is one of the most rarely visited spot in Nusa Penida despite of its spectacular landscape. So, does it really made up of a thousand island? Of course not, but it must has been an exaggeration of some travelers who are amazed by the several formation of sharp rocky islands that protruded from the water. 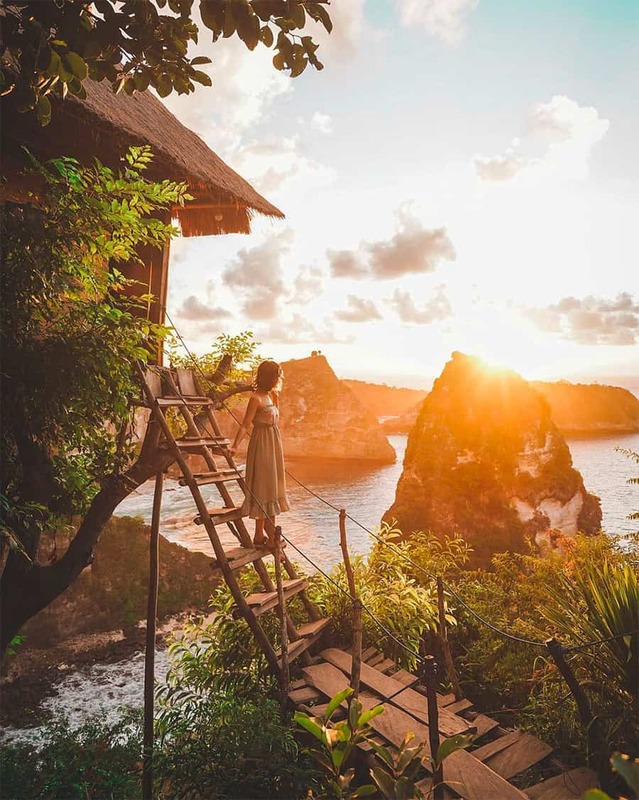 Here’s a little secret: The best viewpoint in Thousand Island Viewpoint is the Nusa Penida Tree House. It’s actually an accommodation, but you can take free instagrammable photo on its staircase. The morning sunrise moment is best relished while waking up at the tree house. While you are in Thousand Island Viewpoint, might as well visit the most famous spot in Nusa Penida East, Atuh Beach. If you only have time to visit one of the place in Nusa Penida East, then you should only visit Atuh Beach. There is an awesome turtle-like island that extend above the water at Atuh Beach. 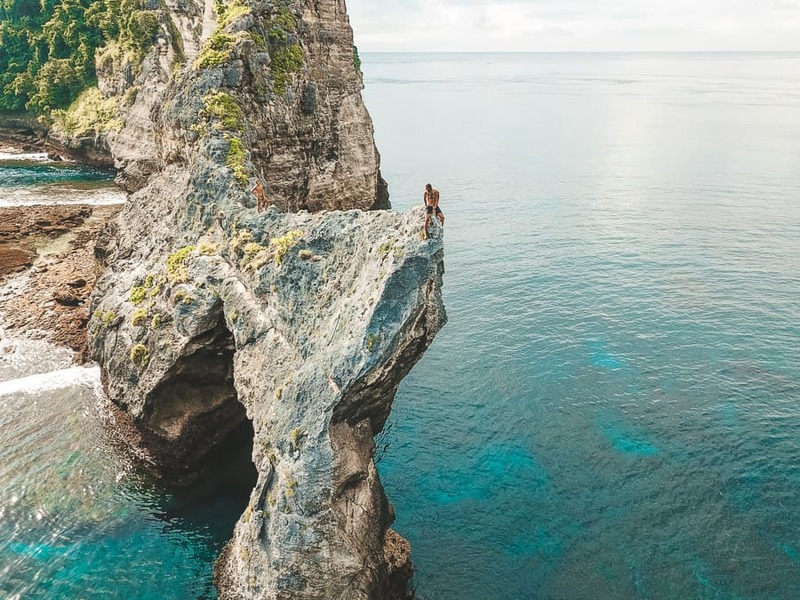 Although it is possible for adrenaline-seekers to cliff jump (refer to Jackson Groove’s experience) from the top of the turtle-like rocky cliff, I really don’t recommend it as the height of the water changes from time to time. Might as well enjoy a fresh coconut on the sunbed and just admire the view. Don’t you agree? ➽ Read Complete Guide to Atuh Beach for more insider tips. The name sounds ridiculous isn’t it? Many visiting tourists probably saw the similarity of the landscape at Tanglad Hill compared to the hill at the children’s favourite show Teletubbies. And hence the name. Despite the name, the landscape is undoubtedly unique. It’s made up of several circular green dunes positioned adjacent to each others. But remember this: the grass which cover the hills only flourished after and during the rainy season. If you visit Tanglad Hill between the dry season, the hill will not be as appealing as the picture below. 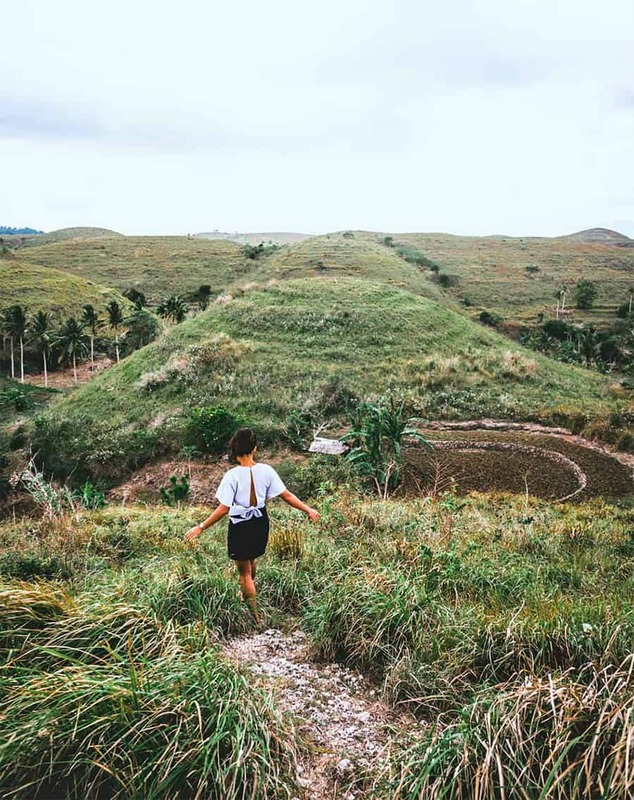 Tanglad Hill is one of the access to Suwehan Beach from Atuh, so if you are ever want to visit Suwehan, might as well visit Tanglad Hill to enjoy the view. Suwehan Beach is probably your last stop when visiting Nusa Penida East. This beach left me speechless the first time I visited. The crystal clear blue water looks glowing from above. 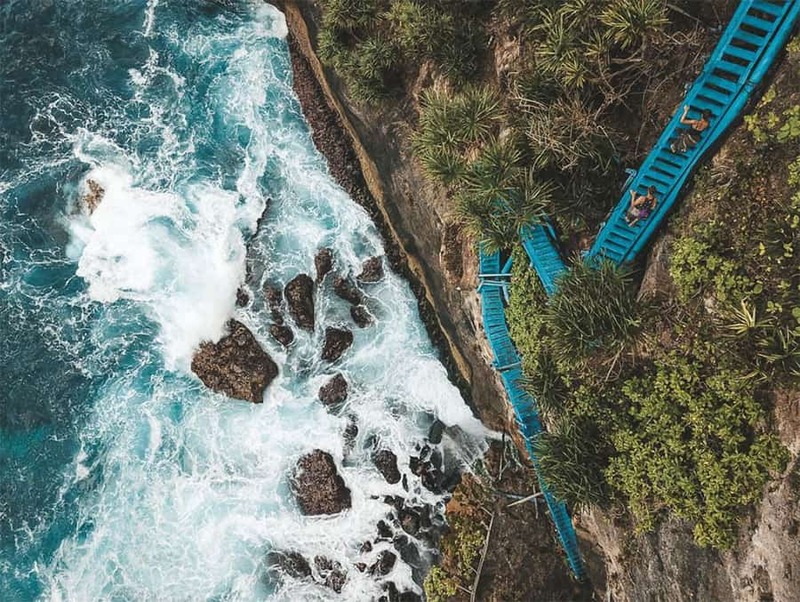 By now you’ll have realised that to get to the beach in Nusa Penida, you will need to climb down endless steep staircases to reach. But, among all of the stairs to the beach in Nusa Penida, the one in Suwehan Beach is the easiest (only 342 stairs to be exact) and the safest (recently upgraded with wooden railings). Once you reached at the Suwehan Beach, you will find white sand beach that stretch over 400 meters with a single triangular rock extend from the water. The best time to visit Suwehan Beach is during the evening and on the low tide. During the high tide the ocean will swallow the whole beach and you will not be able to spend time on the beach. Last but not least, the South region. The South has the least tourist exposure compared to the West and East counterparts. Probably due to the road access to most of the best places in the south are still in really bad condition. 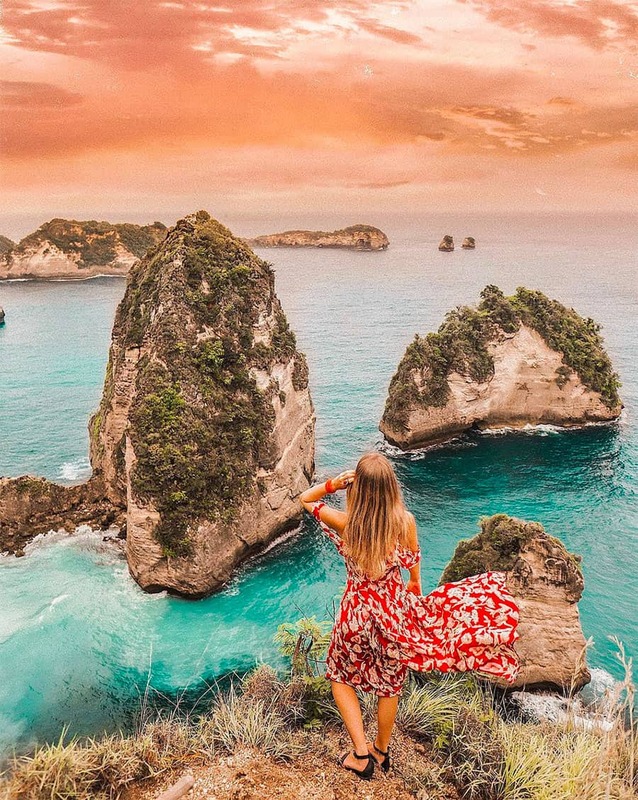 Nonetheless, if you have the luxury of time to explore Nusa Penida, I highly recommend the South region as it offers different scenery views and experiences. Apart of all the best spot in Nusa Penida, Tembeling offers the most unique experience. 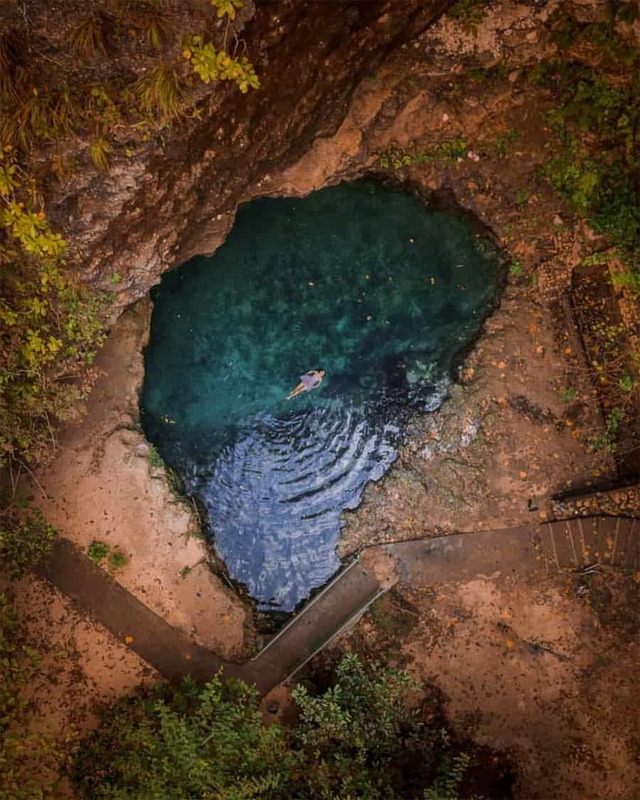 For starters: compared to Angel’s Billabong, the Tembeling Natural Pool is a hidden gem. Everytime I went to Tembeling for a dip in its crystalline pool, I was literally the only person there. Secondly, you can hear the birds and crickets chirping in harmony during the trek down to the pool. The beauty of the forest will comfort your heart. There’s more as you head down to the beach, you will witness another alluring sunset. Just make sure you bring a torch light as the climb up the stairs are dark after the dusk. Here is another astonishing viewpoints at Nusa Penida: The Banah Cliff Point. The access road to Banah Cliff is the worst for all of the best spots listed in this article. If you ride a scooter, please be extra careful. a panorama view to the West: where you can see the tail of the T-Rex Kelingking Cliff from a far. The path to the East: will lead you to Banah Cliff which showcase a beautiful arch island. In Contrast to the name, Peguyangan Waterfall isn’t an actual waterfall like most waterfall spread around Bali. Despite the fact, the journey and experience of being in Peguyangan waterfall is breathtaking. An iconic blue wooden staircases will lead you down to a sacred water shrine and a natural pool dam which faces the Ocean. Mind you, the climb down (and up) isn’t an easy task, there are at least 700 flight of stairs (I lost counts). Once you arrive at the temple, there are four waterspouts where visitors need to bath to purify their body and souls before entering the shrine. As I mentioned above, going further down, you will arrive at the natural dam. The water is crystal clear and the view of the Ocean below is just jaw-dropping. 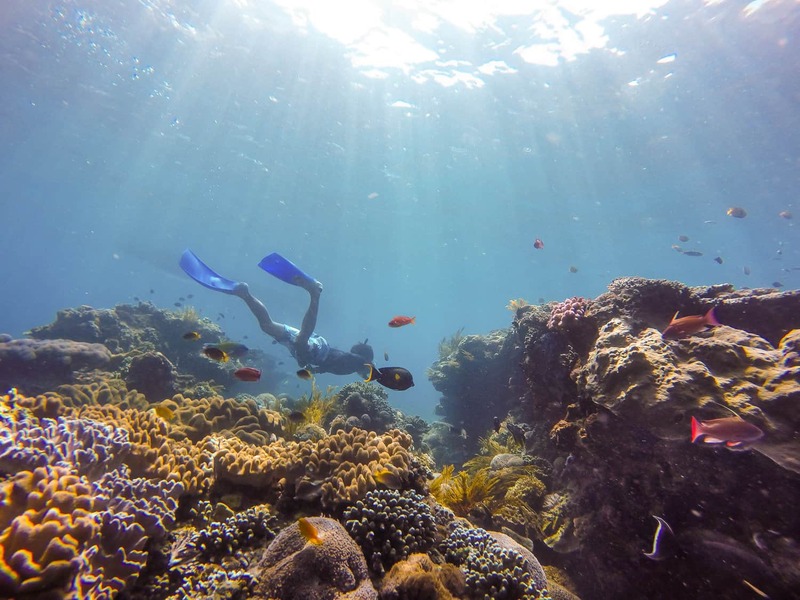 Nusa Penida offers a few snorkeling and diving spot which boast ridiculously gorgeous corals and the rarest sea creatures such as the Manta Rays and the Mola Mola Sunfish. Do you ever wonder where are the best place to snorkel or dive with Manta Rays in Nusa Penida? Actually there are two spots, that is the Manta Bay and Manta Point. Manta Bay is a feeding area for Manta and you have 60-70% chance of seeing Manta on any given day. On the other hand, Manta Point serve as their cleaning station for the Manta Rays, thus you have a much higher chance (80-90%) of meeting one. But I have to warn you that the current are much stronger at Manta Point. But don’t get me wrong, there are some days where you won’t get a glimpse of their existence. If you are a beginner snorkeler or you just got you diving license recently, you would want to pay Gamat Bay a visit. The first is the shallow area protected by the bay. The area is relatively small, enveloped by white sand, colourful corals patches and bommies. The visibility is superb within the bay, so it is highly possible for you to encounter many of the rare reef fish, commensals and nudibranchs. Beyond the shallow area, there is a slope leading toward a deeper level which are also covered with huge bommies. In addition to that, there are larger specimen fishes, and even white-tip reef sharks (rarely aggresive) and sea turtles. There are slim chances for Mola Mola encounter during its season. Temple Point, aslo known as the Buddha Point is the only man-made diving spots in Nusa Penida. So what make it so special? 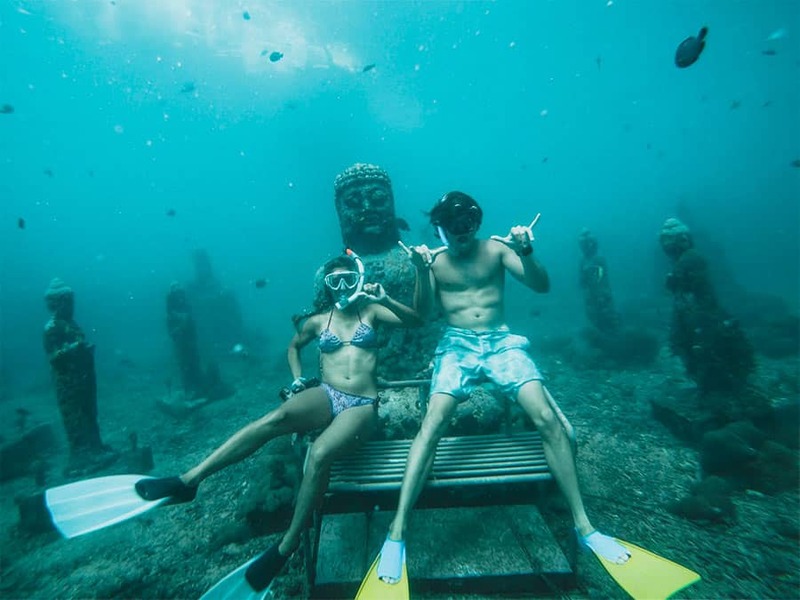 This 7 meter deep diving spot is decorated with Buddha statues, stupas as well as numerous smaller statues. Rumours said that this is basically a submerged art exhibit or maybe a conservation project inspired by a similar project the Underwater Temple Garden in Pemuteran (also in Bali). Regardless, it’s such a unique experience to dive around ruin sites, don’t you agree? 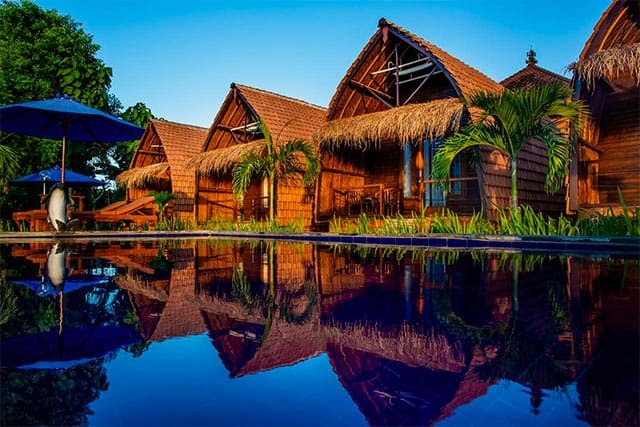 As I mentioned earlier, if you have flexible itineraries in Bali and would like to explore each of the best spot in Nusa Penida, you would have to stay a night or two. I’ll walk you through the whole process. Nusa Penida is the largest island among the three Nusa at the South East of Bali. The only two ways for you to get to Nusa Penida are from: Sanur Beach and Padang Bai Harbour. Each boat accommodate up to 40 passengers. Note: there is no decking leading to the ship. You will get your feet wet upon boarding. You will need to make your way to Pantai Matahari Terbit in Sanur Beach. Once you arrive, make a right turn and you will find a few speed boat companies. Some of the most popular ones are: Maruti Express, Mola Mola Express and Capla. Be warned: you will need to book your tickets in advance if you are visiting Nusa Penida in high seasons. 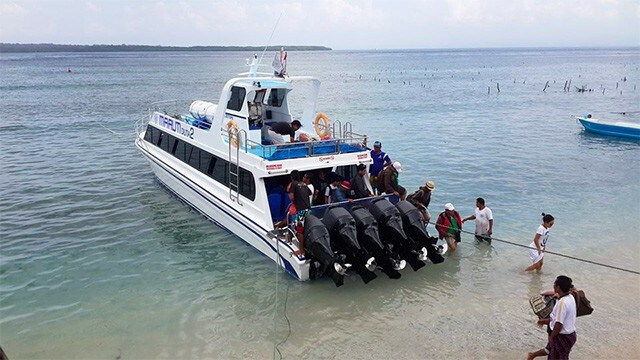 The cost of speed boat trip is between IDR 150.000 to Rp. 250.000 for a one-way trip. 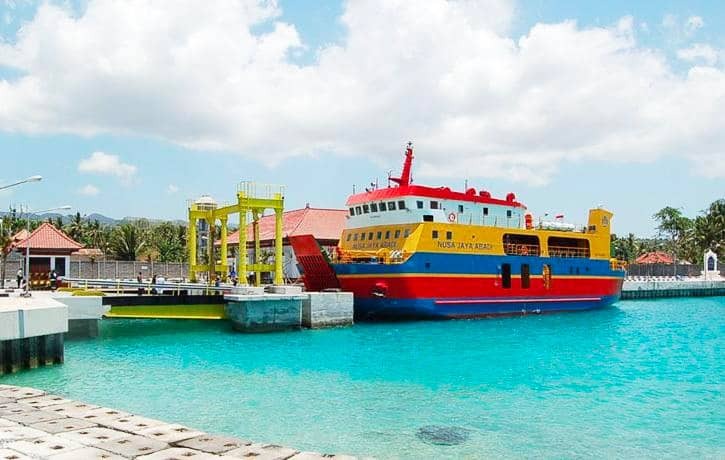 The trip from Sanur to Nusa Penida will take approximately 30 to 45 minutes depending on the weather. Best if – you are looking for cheaper alternative to Nusa Penida or you are driving your own vehicle. Basically, there is no other reason why you should take the ferry to Nusa Penida from Padang Bai other than the reason above. The ferry has no fix schedule. Some says it leaves between 8:30 to 9:30. But the only time I took the ferry from Padang Bai, it left at 11 am. If you still prefer taking the ferry from Padang Bai, then its probably wise to come early (at 6:30 am) and wait for the ticket sales to open. There are cafes around where you can wait and have your breakfast. Honestly, there is no comfortable method to travel around Nusa Penida yet. The roads in Nusa Penida will be the worst road experience you will ever experience in Bali. I remembered cursing the whole journey as my head knocked onto the side window of the car numerous times. The roads are extremely narrow and have countless potholes which are really dangerous if you are driving or riding yourself, especially at night. Lots of tourists love to ride scooter in Bali and probably think it’s a good idea to rent one to explore Nusa Penida. Please don’t! Especially if you have no experience ever riding a motorcycle. 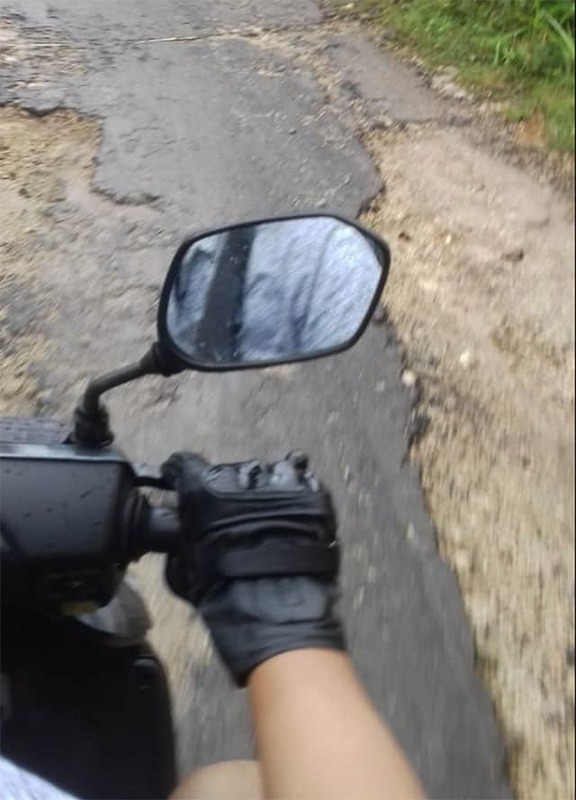 Believe me, but 8 out of 10 tourists who ride a scooter in Nusa Penida will get into an accident at least once during their trip. I’m not kidding. The better alternative is to rent a car with local driver as a guide. 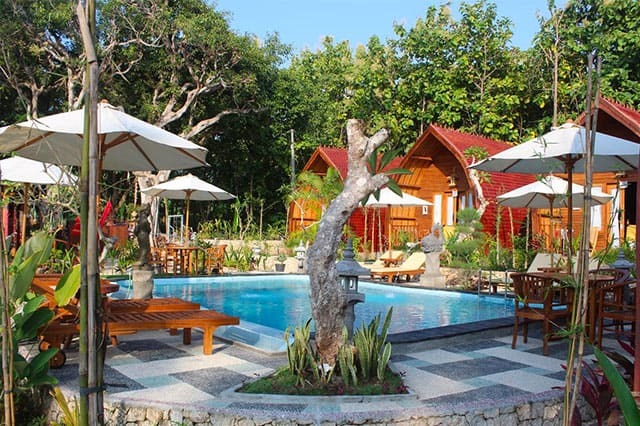 You can either book one in advance or negotiate directly at the harbour (once you arrived in Nusa Penida). Usually it will cost you around IDR 800.000 per day for car rental (with driver) and IDR 80.000 for scooter rental (if you insist). So, what are you waiting for? Nusa Penida is such an exotic gem that’s still rarely visited by tourists. Book a trip to Nusa Penida before the horde of sightseeing tourists populate the island. Trust me. It’ll all be worth it. By the way, while you are here, why not share or save this article! Thanks for the love!